We pick up your order, bring it to our laundry facility where it is processed by our Professional Staff..
Our Trusty Element and New "Big Blue"
Your clothes are then sorted, washed in separate washers, processed per your instructions (Hot – Cold – Warm – Delicate etc.) and never mixed with any other order. Dried as required, folded and placed into our protective plastic covering or hung individually–just like at the dry cleaners. –We hang casual pants, shirts, blouses, polo shirts and skirts— all at no additional charge. Yes, we will even match your socks! –We fold T-shirts (or hang), jeans, underclothes, linens, & towels. However, we can hang/fold any item per your instruction. Your order is then packaged inside our plastic bags and prepared for delivery back to you. –We use low-scent detergents or you can request your preferences. We generally can accommodate your special preferences (must be submitted with your order). 20 pounds minimum per order..
* * We give Free estimates, just ask! You work hard, you play hard, you live a full life. You have “Special Needs” or a temporary disability. Whatever the reason…let us take a load or two off your hands! >> Currently Serving: All of San Diego Central. Including PB, OB, Downtown, Hillcrest, North Park, University Heights, City Heights, Clairemont, Linda Vista, Mission and Fashion Valley, Basically from Highway 52 down to Highway 94 and from the Ocean to Highway 125. 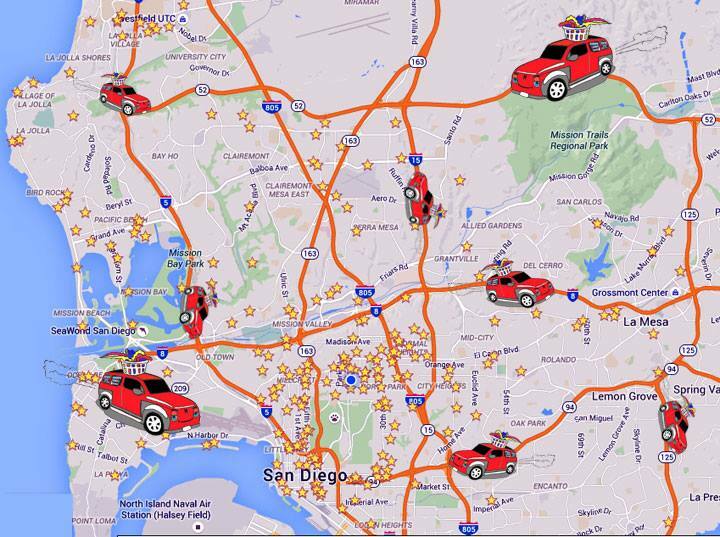 Now serving: East County; El Cajon, La Mesa, Spring Valley, Lemon Grove (let us know if you are not on our map).